Bring a taste of coastal New England to your table with these Maine Lobster Rolls! See how fresh, simple ingredients make these lobster salad sandwiches a crave-worthy summertime classic. I promised myself that when I left for my recent trip to Maine, I would eat all the lobster while I was there. Happy to report: Mission Accomplished. When I posted a photo on Instagram of the lobster rolls we had, I received many requests for a Maine Lobster Roll recipe. I knew I had to get to work steaming up some lobsters and photographing. It also meant I had to eat lobster rolls again. Always willing to take one for the team, friends! In this post, I’m going to take you through exactly what makes a Maine Lobster roll a classic, including what you need (and what you should leave out) for an authentic New England experience. Despite the length of this post (I’m passionate about lobster! ), Maine Lobster Rolls are so simple to prepare. With just a few ingredients and techniques, you can bring the flavors of Maine’s picturesque seashore to your table, wherever “home” is for you. 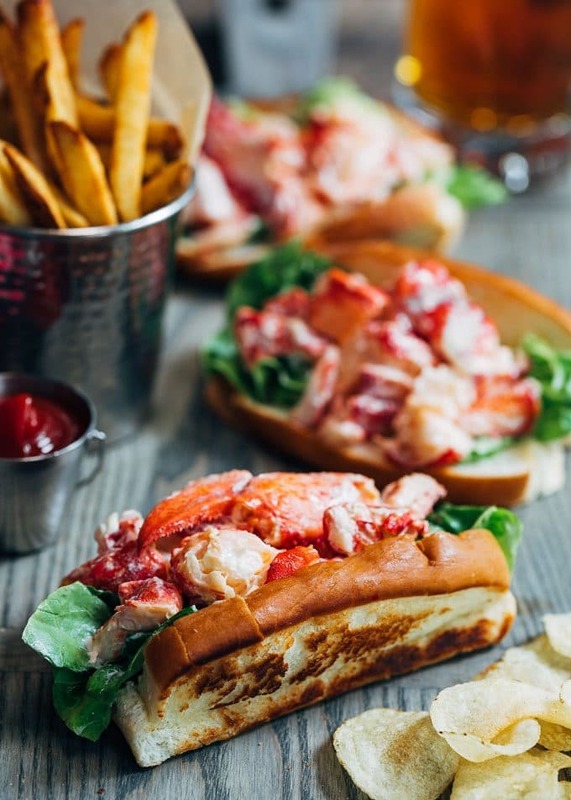 Lobster Rolls are sandwiches that hail from New England, mounding chunks of fresh lobster meat onto buttered and griddled split-top hotdog buns. One bite takes me right to the sound of the ocean, warm, salty breezes, and the sand beneath my toes. It’s summer on a bun. How the lobster itself is treated differentiates styles of New England Lobster Rolls. Recipes fall into two general categories: Connecticut and Maine. To make Maine Lobster Rolls, steamed lobster meat is cooled and lightly-dressed with mayonnaise. The lobster salad is served cold, piled into a griddled hotdog bun. Connecticut Lobster Rolls are served warm. The lobster meat is dressed with drawn butter and mounded into a similarly-prepared bun. 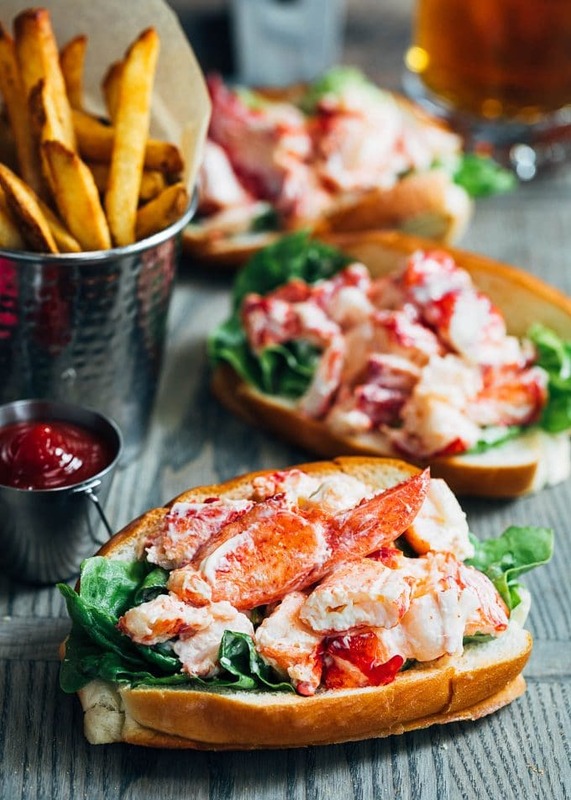 Connecticut Lobster Rolls contain no mayonnaise. New England lobster rolls, whether Connecticut or Maine-style, are all about the lobster. They’re made with very few ingredients and let the sweet, delicate lobster itself be the star of the show. I make Maine lobster rolls with fresh lobsters that are about 1-1/2 to 1-3/4 pounds in weight. This will yield about 1 pound of lobster meat total for 4 lobster rolls. For lobster rolls, I like to stick to two classic cooking techniques: boiling or steaming. 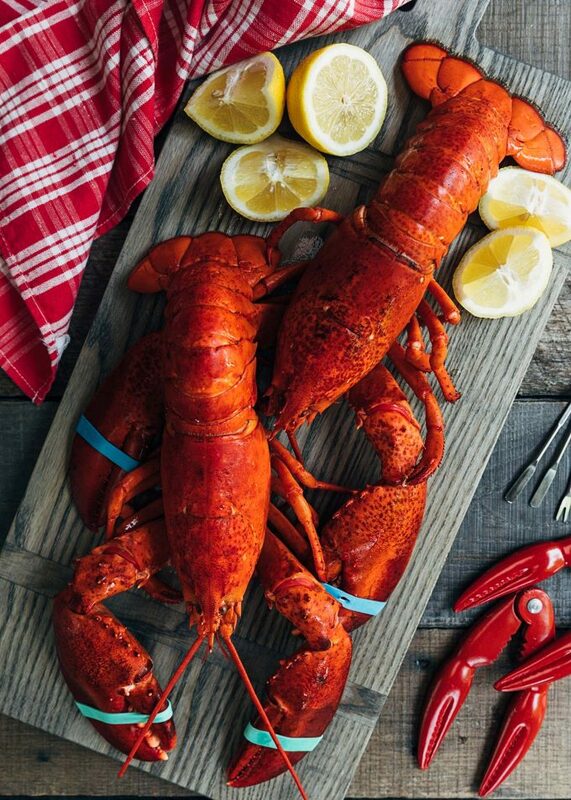 Boiling typically allows you to cook more lobsters at once, convenient if you’re entertaining a crowd. The meat is also easier to clean from the shells. Steaming yields a more tender and flavorful meat since the lobsters aren’t submerged in the boiling water. It’s also more difficult to overcook lobsters when steaming. For more information about cooking techniques and tips, check out Cooking Lobsters By LobsterAnywhere. I’ve cooked the lobster meat! What’s next? Once you’ve removed the tail and claw meat from the shells, cut it into large-ish chunks. If I’ve been skillful enough to remove the claws in one piece, I like to leave them as is, to lay across the top of each lobster roll. It makes an impressive presentation. For Maine lobster rolls, gently toss the lobster meat with a good-quality mayonnaise. Again, the lobster is the main focus here, so you want just enough mayonnaise to bind the lobster salad, but not so much that it weighs it down. Since some mayonnaise brands are more tart than others, I like to taste the lobster salad and add just a small squeeze of lemon juice if it needs a little brightening. Beyond mayonnaise, every other addition to a Maine lobster roll is subject to debate. Some classic recipes call for adding chopped celery to the lobster salad, for a bit of crunch. I prefer my lobster rolls without it. Adding lettuce to the bun before mounding the lobster salad can also be a hot topic. I like a small leaf or two of Boston lettuce, but not too much. I’m not a fan of lobster rolls that skimp on the lobster and appear falsely plump from lettuce. The horror! 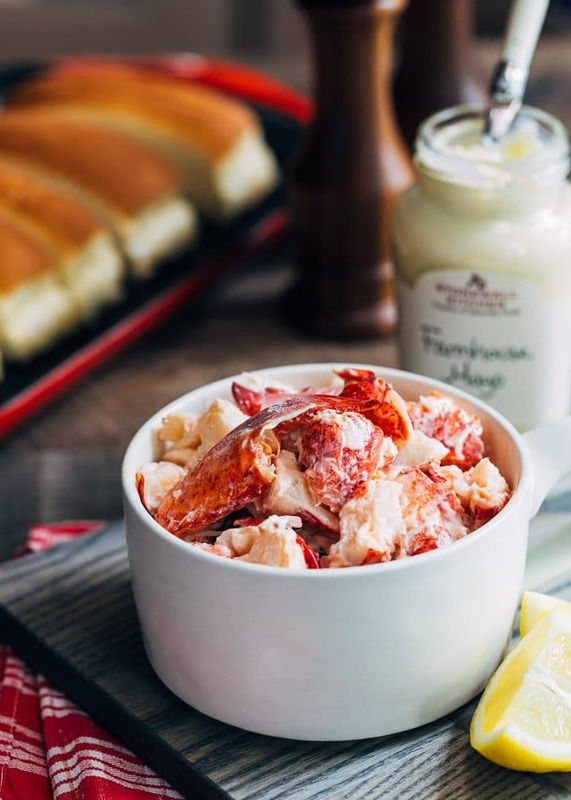 Add-ins that are delicious with lobster, but do not appear in a classic Maine lobster roll include capers, Dijon mustard, tarragon, scallions, avocado, bacon…and just about any other ingredient outside of those mentioned above. Lobster. Mayonnaise. Buttered/Griddled Hot Dog Bun. Maybe a touch of celery and/or lettuce. For Maine lobster roll purists, that’s all! Split-top hotdog buns are the traditional choice for Maine Lobster Rolls. If you can find the New England-style buns that also have flat sides for toasting, your at-home experience will be all the more authentic. The flat sides of New England hotdog buns toast especially well on the griddle, creating a buttery, crispy exterior and soft middle. While my grocery store in New Jersey sells split-top hotdog buns, it can be difficult to find them with flat sides here. I brought a package home with me from New England, but you can also find them online. Or, if you enjoy bread baking, you can make them yourself at home with a New England Hot Dog Bun pan. Fun read: In Praise of the New England Hot Dog Bun, from New England Today. 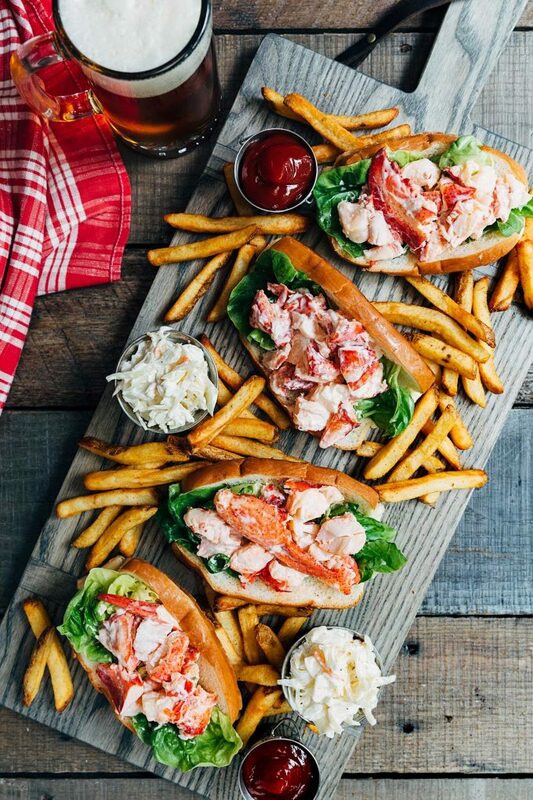 Just like when I’m oceanside, I love to serve these Maine Lobster Rolls with lightly-seasoned French fries or kettle chips and coleslaw. I’ve also seen them served with a dill pickle, but honestly, I usually dive in for the fries or chips with a lobster roll first! Lobster Rolls are great served with iced tea or a cold beer. My favorite pairings are witbiers and witbier-style brews, such as Allagash White (also from Maine) and Hoegaarden White. I also like saison with lobster rolls. You want something crisp that isn’t going to overpower the flavor of the lobster. Remember: for a classic lobster roll experience, the lobster is king! Simple lobster salad meets buttery, griddled buns in these classic Maine Lobster Rolls. A taste of a New England summer at home! 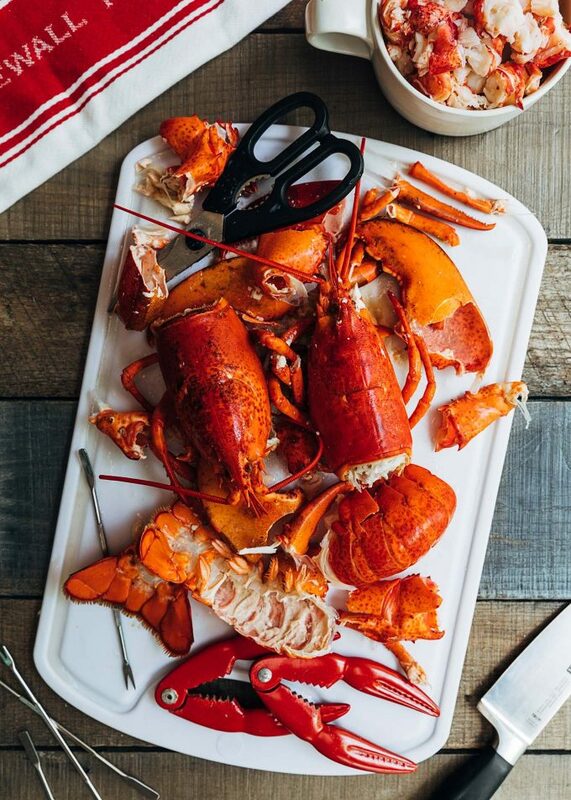 Remove tail, knuckle, and claw meat from the lobsters and cut into 1/2-inch chunks. You should have about 1 pound of lobster meat. Refrigerate until chilled. Drain lobster meat, discarding any liquid. Gently toss lobster with 3 tablespoons mayonnaise and celery (if using). The lobster should be coated, but not weighed down by the mayonnaise. Add an additional tablespoon of mayonnaise, if needed. Taste the lobster salad. Some brands of mayo have more tang than others. If the salad needs more brightness, add a squeeze of fresh lemon juice. Season to taste with salt (if needed) and pepper. Cover the lobster salad and refrigerate for 30 minutes, or up to 6-8 hours. When ready to serve, preheat a griddle over medium heat. Butter the sides of the hotdog buns and grill 1-2 minutes on each side, until toasted. Place a leaf of lettuce (if using) into each griddled hotdog bun and mound each with 1/4 of the lobster salad. Serve immediately with french fries, kettle chips, coleslaw, and dill pickles, if desired. 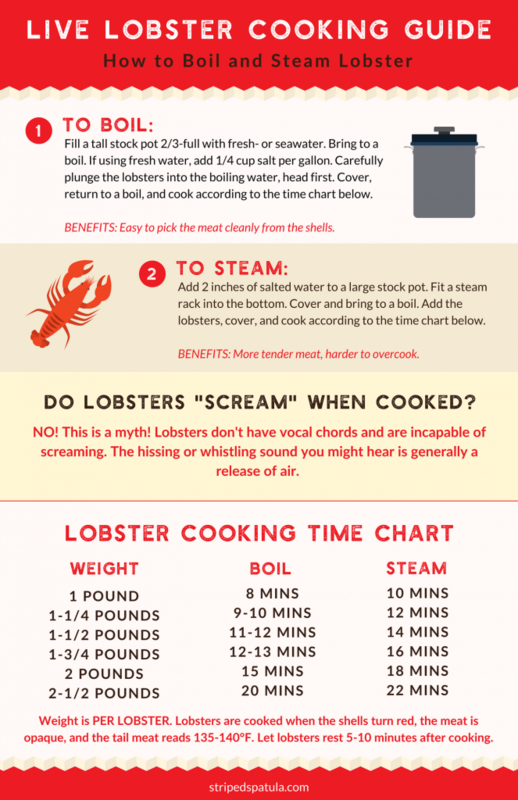 For step-by-step instructions, see the Lobster Cooking Guide infographic in the blog post above. To save time, you can also ask your seafood market or the seafood counter at your grocery store to steam the lobsters for you. Some will even remove the meat from the shells. Just wanted to say how much we love your blog and recipes. I remember lobster rolls from a visit to Peggy’s Cove many decades ago and these brought back those memories. My SO won a recipe contest at work with his fellow electricians and I used this recipe as a guide – and passed it on to all! I will be making them for my kids and grandkids on the West Coast on my next visit. Your missing quite a bit of meat in the body and legs. you can use a rolling pin to squeeze the meat out of the legs. Thanks for your comment, Sean! We prefer to have the lobster leg meat as a secondary treat and use the claw, knuckle, and tail meat for the lobster salad. Love those chunks of meat in a lobster roll, as enjoyed in Maine! Oh girl. These photos had me feeling like I was flipping through Bon Appetit magazine. I love the gloomy mood you set with the pops of bright color—I think this style compliments seafood recipes so perfectly. There’s something really coastal about it. ANYWAY. The actual recipes is to die for. Buttery, toasty bread hugging soft and sweet lobster + creamy mayo is a damn dream. I’m so so in love with this recipe, Amanda. Sharing it with the world! I never knew the difference between Maine and Connecticut lobster rolls. My favorite lobster roll at the shore is a hybrid- the lobster is served cold, salad style but it comes with a side of drawn butter that I smother the lobster salad in. These lobster rolls look so good! Yum! My gosh, Amanda!! I really respect you and all you’ve done so that we can have the Maine Lobster Rolls. What a sacrifice!! So let me tell you how much I appreciate all you went through — yes I remember the bug bites. But I hope all is well in the end and now we have a recipe to try. I could eat those rolls every day. I’m not too familiar with preparing lobsters — just eating them. Your instructions and tips are certainly worth keeping handy. Since I live in the Midwest, I’ll have to make my own lobster rolls. This is such an incredible post and recipe. So clear and informative. We absolutely die for a good lobster roll, and it doesn’t get any better than a fresh lobster roll from Maine. I am salivating reading through this and looking at the gorgeous shots. Thanks for amazing inspiration and guidance on making an incredible Maine lobster at home!! I have been dying to make lobster rolls and home and seeing your beautiful post makes me want to do it even more! Some day I hope to get to Maine so I can have myself an authentic one. Until then, I’ll learn to make them at home! These look scrumptious and simple to make. I had no idea that there was a difference in Maine and Connecticut lobster rolls! I’m definitely going to get me some lobster rolls when I make my trip to Maine too. I am SO excited for this post – you don’t even know! I’ve never had Maine lobster rolls because I’ve never been to Maine! I spent most of last fall bugging my partner to see if he’d be game for a road trip down from Canada so I could get my fill of authentic lobster rolls. I’ll have to make these to tide me over until he drives me down! How I wish I lived near the water. I LOVE lobster….but unfortunately I can only get frozen most of the time. This is right up my alley. I even have convinced my husband to like lobster. I would be in heaven ….and eat these for breakfast, lunch and dinner. I can’t wait to try these recipes. I LOVE lobster and have had the chance to enjoy both Maine and ct lobster rolls. Going to my nieces in august and my friend in Maine in October! Lobster rolls here I come! Besides sounding like great recipes, you write very very well. I enjoy always reading your articles! Yes!! As a girl from New Hampshire, this speaks to my New England roots. I’m so glad you did Maine right! And what a recipe- it’d make any New Englander proud!! Thanks for the comprehensive info on making lobster rolls. I’ve never even cooked a lobster, but your directions are super clear and easy to follow. This recipe sounds delish….I pinned it to make later this summer.